Windows NT 4.0 on Hyper-V 2016 - C:Amie (not) Com! For reasons that defy any sane logic, I decided that I needed to install NT 4.0. It’s 2018 and over the last few years I have been slowly clearing out all of my old IT hardware, to the point now that I no longer have any legacy motherboards or systems in the house or office. 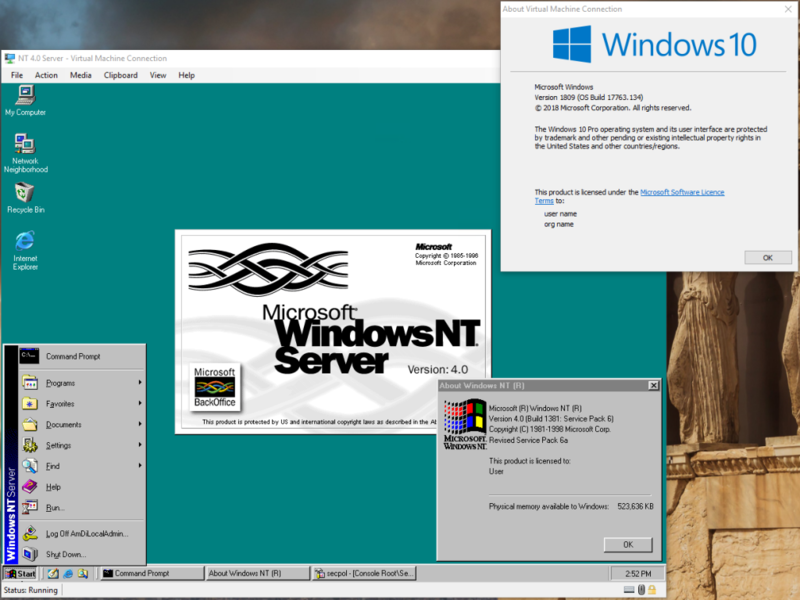 So when I recently needed to fire up Windows NT 4.0 once again – for reasons that defy logic – you would assume that Virtualisation was the easy win. Sadly – and especially with Hyper-V – this is not the case. Microsoft’s virtualisation solution is (and always has been) designed around its currently supported operating systems, with a little Linux added in to the mix in more recent times. Down-level operating systems are not supported and by default, are not going to work. This is especially true of what in effect is Windows 1996, the workhorse wonder that was Windows NT 4.0. I am sure that the non-masochists of you will just use something like VMWare or Virtual Box to do thy bidding and carry on with their day… but I digress…. Note: This process is will be very similar for Windows NT 3.5 and NT 3.51 as it will be for Windows 2000 – however Windows 2000 does not have the 8GB disk/2GB partition initial size limitation. The following procedure will get you up and running with a working NT 4.0 install under Hyper-V 2016. I am assuming that you know your way around Hyper-V and this article is intended as a results based guide, not a step-by-step ‘click here, go here’ guide. By default, Hyper-V will attempt to run the VM under its default modern architectures mode, compatible with Windows Vista+ systems. The 1996 Windows NT 4.0 code-base is not compatible with modern platforms or CPU instruction sets and if you attempt to boot to the NT text mode installer without addressing this issue, NT 4 will blue screen while attempting to bootstrap the installer. To fix this, you need to enable the legacy CPU compatibility. This used to be a GUI option in Hyper-V 1.0 under Windows Server 2008, but the option was removed in later releases. Despite being removed from the GUI, the option does still exist in the Hyper-V core and can be re-enabled for the VM using PowerShell. Boot your Virtual Machine from the floppy/CD and enter text mode and follow through the setup process. You do NOT need to add any additional mass storage device drivers (this includes the NT 4.0 SP4 ATAPI update, which if you attempt to add the updated driver, the installer will ignore). When prompted to choose the keyboard layout, language and confirm the computer type. Change the computer type to “Standard PC” for a single core VM or “MPS Multiprocessor PC” if you require access to two cores. Enter your preferred keyboard settings as required. In the drive partitioning section, create an NTFS partition of less than 2048MB. I would suggest 1024MB for simplicity. Do not attempt to create a larger partition. The reason for this is that NT 4.0 will initially format the VHDX as FAT16, which has a maximum partition size of 2GB. During the later installer process and before entering GUI mode setup, NTFS conversion will be run over the FAT partition, converting it into an NTFS 1.2 file system. You will patch it to NTFS version 3.0 after installing NT 4.0 SP4 or later. If you receive an installation failure because setup cannot write to the Windows folder or a setup error stating that permissions could not be created, this is most likely caused by you creating the initial VHDX larger than 8GB. There are no special requirements or steps to perform during GUI Mode Setup. Auto detection of the Network card will work with the Hyper-V Legacy Network Adapter. Ensure that you properly configure TCP/IP and remove IPX/SPX from the protocol list (unless you specifically need it). Install SP6a (SP4 at a minimum). Increase the RAM from 512MB if required. In Hyper-V Manager/PowerShell edit the virtual disk and set the maximum size to your required size (e.g. the default 127GB). In Windows Server 2016, locate the VHDX and mount the disk. Using PowerShell or Disk Manager, expand the partition to fill the entire size of the disk. Note: If you are using a multi-processor VM, rename the halmps.dll.softex to HAL.dll and do the same. Install Internet Explorer 6.0 SP1, patch and update the Windows install, install application and configure to your needs. If you are playing with NT 4.0 for the first time, then there may be some things that you are not aware of. Here are a list of a few points that are worth noting should you be the Windows equivalent of a millennial (pun intended). The total install size (less the page file), after patching and cleaning up uninstall data was ~320MB. They don’t make them like that any more! NT 4.0 does not support plug and play. If you want to add hardware, you have to do it manually via a plethora of different places in the control panel – there is no device manager! NT 4.0 is extremely insecure by default. Know that it has no built-in firewall and that the base system policy and security configuration is insecure by default (even file system permissions are a free for all). You should keep this in mind when attempting to do anything at all with NT. If it really needs to be on the network you should at a minimum harden system policy and add a firewall (ZoneAlarm Free was the go to back in the day). There are no display drivers for Hyper-V. This means that there is no mouse integration and as such you will be unable to install NT 4.0 over a Remote Desktop session. It also means that you will be stuck at a max resolution of 800×600 in 16 colour using official means. Unofficially, you can make use of the great work of the VBEMP NT project to increase the resolution and get NT 4.0 running at modern resolutions and up to ‘True Colour’ (24-bit). This does not offer any cursor integration between the VM and the Hyper-V Manager, preventing mouse use over a Remote Desktop connection and requiring the ctrl + alt + left cursor to escape the Hyper-V Connection window. There are no sound drivers for NT 4.0 in Hyper-V (unlike there used to be in Virtual PC) as Hyper-V does not emulate any sound adapters. The disk performance is fairly poor, until you have patched up to SP6a + the SP6a URP (Q299444). You can further improve performance by enabling DMA Mode on the IDE adapter and write caching on the VHDX. NT 4.0 by default does not use SMB signing and uses LAN Manager authentication instead of NTLM. It can use NTLM v1/2 once it has been fully patched. However, be aware that this means that it will be unable to communicate with Windows XP SP2+ or Windows Server 2003 in their default configurations. You will have to perform some security hardening on NT 4.0 or security weakening on XP+ to get SMB working. Hint: It’s the same process in the registry on both, so security harden NT 4.0 after installing SP6a. NT 4.0 ONLY supports SMB 1.0 / CIFS (“SMB 1.5”). Microsoft have been removing support for SMB 1.0 with each successive Windows release. Under Widows Server 2016 and Windows 10 SMB 1.0 support is an optional component/feature that you may need to install manually. Note: You should not be using SMB 1.0 at all in 2018 as it is a 100% exploitable security risk. Create a SMB share on the root of the C Drive and set Guest access to read/write (modify) under NTFS and Share permissions. Note: before it is patched, you will struggle to SMB into NT 4.0 using a username and password combination unless you weaken the security policy on the calling client. Using the guest account bypasses the problem. Use an intermediate level VM/system as a bridge between newer and older SMB versions. For example I used a Windows Server 2008 VM to pull data from third server with a SMB 2.x file share of updates and drop them onto the NT 4.0 SMB 1.0 share found at c:\shared. Once NT 4.0 is patched, you should disable the guest account again, remove its permissions to the file share and authenticate into NT 4.0 using a normal user account found in the SAM database. Do note my warning above about SMB signing however, which will scupper you unless you have made mitigations via hardening. Once you have done all of the above, and have a fully patched system. You will have something resembling the below running in Hyper-V 2016.